Electronic Instrument Rook #MusicMonday « Adafruit Industries – Makers, hackers, artists, designers and engineers! This project started with my interest in instrument design. I have always loved electronic music, but I have also continually felt the need for more physicality in the performance experience. So many years ago, I just started designing instruments that would allow me to do that. This project features two identical versions of my most recent design – Rook (so named for its shapely resemblance of the chess piece). These instruments feature three sections, which allow for a range of different physical interactions in addition to providing greater sonic potential. Two infrared sensors read the height of any object above them. A capacitive touch board features two touch strips, each of which counts the number of fingers being used and senses finger placement. And the last section uses a contact mic to provide more precise rhythmic content (which I particularly wanted for a percussion piece). 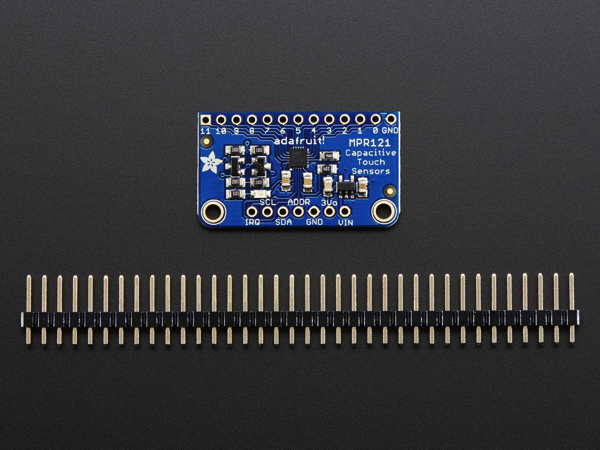 Adafruit 12-Key Capacitive Touch Sensor Breakout – MPR121: Add lots of touch sensors to your next microcontroller project with this easy-to-use 12-channel capacitive touch sensor breakout board, starring the MPR121. This chip can handle up to 12 individual touch pads.